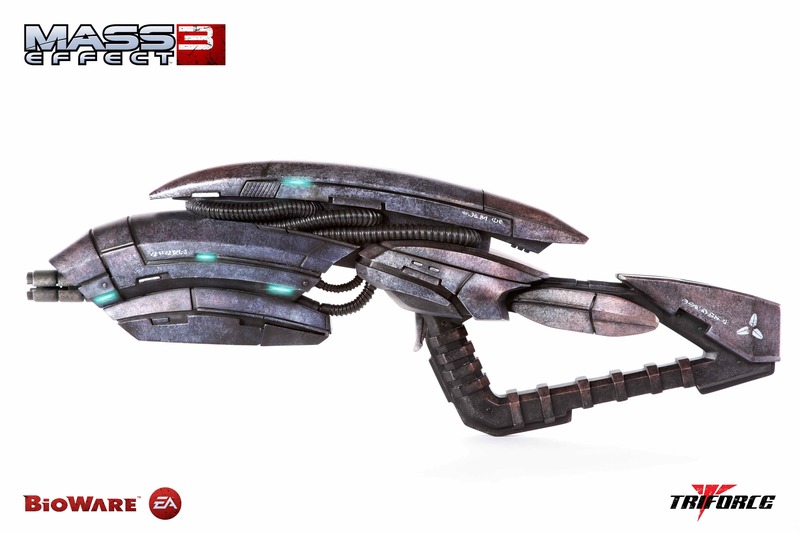 You could own a model of Commander Shepard's favorite gun on the Citadel. There's always praise and discussion around Mass Effect's storyline and characters, but don't forget that the series has had some really cool-looking guns. Futuristic designs with a firm grounding in practicality have made for some excellent replicas, from fan-made creations to some notable professionally-crafted models. 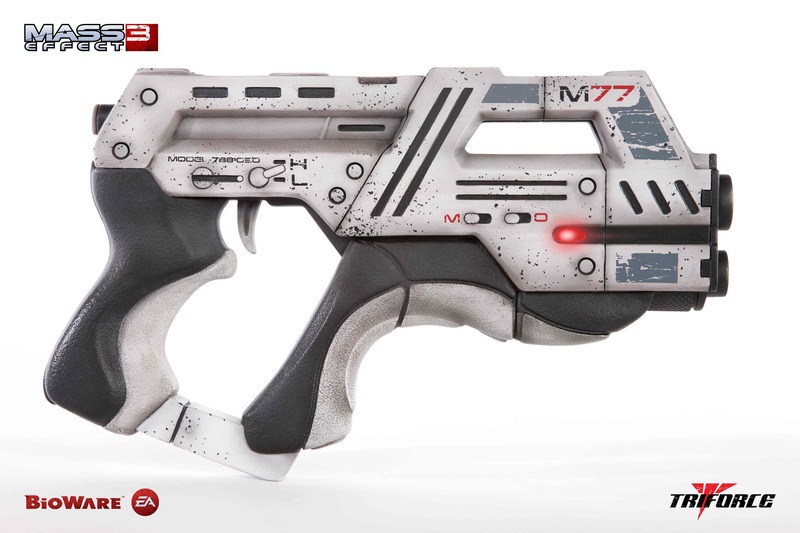 Acclaimed replica manufacturer Triforce is adding a few more entries to the upper end of that list with three new replica weapons from Mass Effect 3: the M-6 Carnifex, the M-77 Paladin, and the Geth Pulse Rifle. Each of the guns is a 1:1 scale replica of the in-game model, expertly sculpted, painted, and cast in polystone. 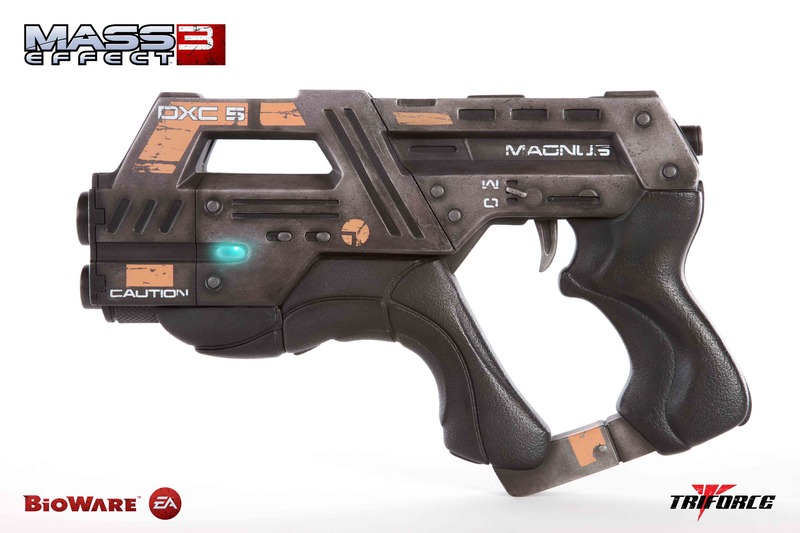 The Carnifex and Paladin pistols measure 12.5 inches in length and weigh seven pounds, while the Geth Pulse Rifle has a little more heft, stretching 33 inches and weighing in at 20 pounds. All three models feature some flashy LED effects. Quality craftsmanship doesn't come cheap, though, so you'd better have some spare credits set aside. The pistols will be retailing for $400, shipping in Q3 2013, and the rifle will set you back $750 when it ships in Q1 2014. These are collectors' items, for sure: none of the models will have more than 500 units produced worldwide. If you're one of the lucky/wealthy few, though, you'll be sure to earn admiration from your sci-fi gaming friends, and probably some strange looks from everyone else. Pre-orders are open now on Triforce's website for the Carnifex, Paladin, and Pulse Rifle. While you're there, you can check out Triforce's previous foray into Mass Effect weaponry, the M-3 Predator pistol and M-8 Avenger assault rifle. These guys know their pretend guns.